Treadmills are great inventions that have enabled us to maintain our exercise routines indoors, away from the elements and bad weather. They have proven quite effective in burning calories, enhancing cardiovascular function and toning muscles. However, science has proven that working out on a conventional treadmill isn’t quite similar to running outdoors. As much as it simulates the feel and mechanics involved in real running, variables such as wind speed, air resistance, and terrain are hard to create. In addition, with a regular treadmill, you basically try to keep up with the motion and speed of the machine. Running outside, on the other hand, involves using effort to push your body weight forward. Incline trainers, which mimic the gradient of different terrains to provide a challenge as an outdoor environment would. They seek to compensate for the aforementioned variables by providing more resistance through a steeper gradient. Generally, a 2% gradient is what’s necessary to achieve the optimum outdoor condition on a treadmill. So, most incline treadmills come with incline settings ranging from 1% to 12% to offer an even better challenge for better and quicker results. Some high-end options can even go as high as 40% for intense hill-climb-like workouts. Others also offer decline options to mimic a downhill running experience. All these factors combined contribute towards targeting different areas and muscles at varying intensity to achieve the desired results. Incline treadmills are multipurpose hence are a good replacement for frequently used cardio trainers like ellipticals and stair steppers. However, not all incline treadmills are made equal. They vary in incline/decline degrees, max speed, track design, size/length, workout programs, and additional quirks and features. That being said, here are some of the best incline treadmills in the UK to consider. 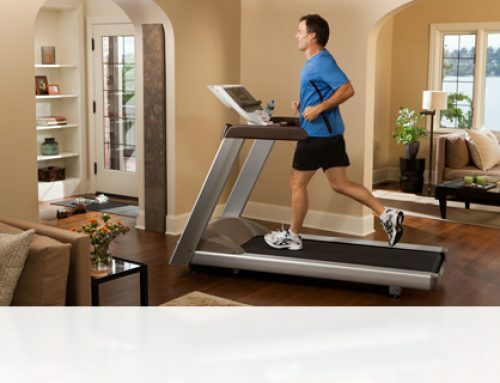 This incline treadmill is quite popular thanks to its host of interesting features. The first thing to note is its 20-level incline capacity. This allows you to burn calories four times faster when just walking. Consequently, it has an ergonomic digital controller built into the handrails for easy access. The same technology also provides for a smoother and safer speed change. JLL S300’s motor starting speed is 0.3km/h and can clock 16km/h for speed training. Another interesting feature is the 16-point cushion system which absorbs most of the foot impact during a workout. It works by reducing pressure on your ankles and joints allowing you to train harder and longer with less injury risk. The running area is fairly long too. It measures 1230mm long and 410mm wide, providing enough space even for tall runners. Besides that, it supports up to 15 running programs. You can reset the first three to your desired speeds. Other extra features include easy fold/unfold system, an aux port for music, and wheels for easy movement. This fantastic incline treadmill delivers 10% incline gradient capability. It isn’t short on speed either. Nordic goes up to 20km/h. So if you don’t fancy yourself on those steep gradients, perhaps some high-intensity sprints will cut it for you. The T6.5 S also packs a lot of futuristic features. With the iFit technology, you get access to almost unlimited workout programs but only if you have an active iFit membership. 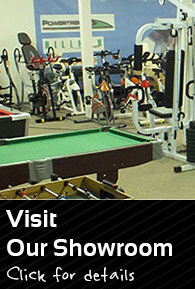 Otherwise, you can take advantage of the additional 20 built-in workout options programmed by fitness experts. Another flagship feature is its large backlit display (5 inches) that allows you to keep track of your workout time, distance covered, heart rate, and calories. The treadmill’s system uses this data to tailor exercises for you. Also worth mentioning is the flex-select cushioning that minimizes the impact on your feet. You can either choose that or switch to the available firm deck mode that simulates the hardness of a real road. If you’d like to work out in a peaceful and quiet manner then this treadmill is meant for you. With its almost whir-less motors, you won’t even know it’s on. The quietness, however, doesn’t affect its power. It is more powerful than most treadmills and delivers top speeds of 12km/h. You can control it from the multi-purpose LCD display, which also allows you to select your workout program from a list of 12 inbuilt options. XM-PROIII comes with a unique feature, and that is a built-in safety switch that brings it to a grinding halt in case of an emergency. Consequently, it is lightweight and foldable for hassle-free storage. The large running belt of dimensions 1000mm (L) x 400mm (W) provides adequate room for various running styles. Extra features include speakers for entertainment, cup holders, and a towel rail convenience. Its incline is manually operated and goes up to 3 levels. With an impressive 22-level incline, this isn’t a treadmill for the light-hearted. Whether you want it for some lightweight home workout or intense athlete-level training, it has all the options to cater to your needs. Its large collection of 21 professionally tested programs is another great selling point. The Elite runner Pro has one of the largest running belts in its class measuring 1400mm by 480mm. The maximum speed of the belt is a staggering 21km/h. Besides that, you will also love the good customer support offered by the brand. The ProForm performance 300i incline treadmill delivers a quick incline control ranging from 0-10%. This is enough to get your heart pumping optimally as well as burn calories effectively. In addition, it comes with a 2.0- 2.75 CHP motor that is built to stay cool even during endurance workouts. Additionally, you can increase the speed to 10mph for maximum cardio benefits. Another thing to love about this treadmill is that it allows you to set your own time- and calorie-based goals for quicker results. If you are keen on room organization, you will definitely love the space saver design donned by this machine. It can be folded conveniently to maintain your room clutter-free. This incline treadmill offers what most of its class competitors don’t, a 7% rear frame decline. This enables you to target a wide range of muscle and joint groups like never before. It also comes with a multi-function LCD display that shows your pulse rate, calorie burn, distance covered, and time. This can help you track your progress as you work out, a great way to motivate yourself. 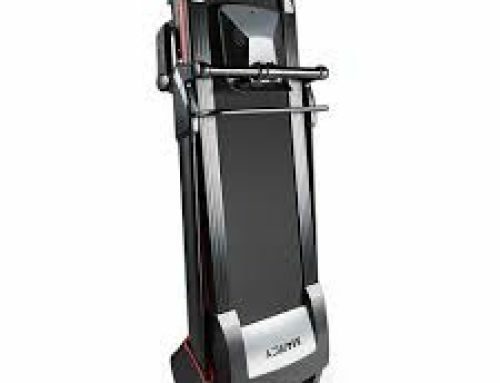 The engine is powered by a 500-watt motor that is not only sufficient for your workout needs but also low on power consumption. 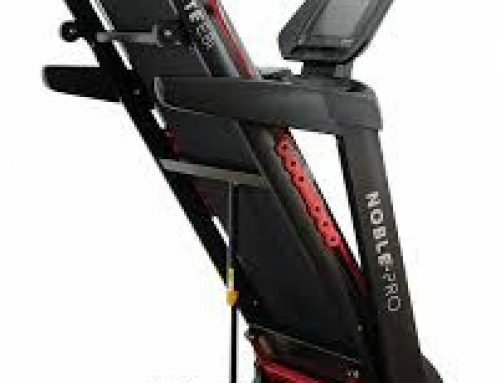 Besides that, the V-fit incline treadmill is known for its compact design. You can, therefore, use it anywhere in your home after which you can fold it quickly for easy transport or storage. Extra features include an auto-stop system for emergencies and a shock absorbing deck to reduce the impact on your feet. The TF-370 incline treadmill is as sturdy as they come. It also comes with a year warranty on the whole equipment plus a lifetime warranty on the motor alone. Besides that, it has a manual incline that delivers up to a 15% gradient. This makes it idyllic for a wide range of users seeking varying workout intensities. From its blue LCD display, you can monitor all your vital aspects as you run. The ergonomic knobs on the handlebar allow you to adjust its speed according to your needs. The maximum speed is 14km/h which is fast enough for extreme cardio workouts. With a strong treading deck of dimensions 1200mm x 390mm, it covers all sorts of runners with varying running styles. This incline treadmill falls in the compact segment owing to its tight dimensions. It, however, comes with a powerful engine delivering 2.0hp and a top speed of 16km/h. This makes it a perfect tool for short bursts of speed, high-intensity runs, and lengthy endurance treads. If you want an extra challenge for faster and more pronounced results, crank into up a notch with the help of the 12% incline capability. Besides that, if you feel a little less motivated somewhere along the way, Reebok ZR delivers 24 assorted fitness programs from where you can draw your inspiration. These are pre-programmed into the system. A 2.2 CHP engine with up to 4.37% incline capacity speaks it all for this compact incline treadmill. Also available are 9 unique built-in workout programs that give you direction on your training mission. Another ingenious feature is the pause function. It is meant to stop your run while maintaining the current stats. This way, you can catch a quick rest before you resume your routine. The total user weight supported by this incline treadmill is 220lbs. Consequently, it has a running belt that measures 48.82 (L) x 15.7 (W), which is not bad in its segment. The controls are also quite nimble and conveniently placed on the handrail. Other features include a clear LCD display and soft-drop system for a safe and quiet setup. With the information on this post, you will be better placed at finding the best incline drill in the UK. Just pay attention to the key features including incline percentage, speed, quality, and belt size to name a few.